Just over a year ago, I began my blog. I meant for it to be a hobby, to record my allotment antics and showcase some of my culinary creations. Blogging also served as a distraction. It meant that I could switch off from thinking about work. It has steadily grown more central to my leisure time and has brought me so much personal pleasure and joy, with D, my husband sharing many of these moments with me. Most of all, it has brought many wonderful people into my lives, people who I perhaps ordinarily would not have the opportunity to converse with. Normally I am quite a private person and tend to keep myself to myself. 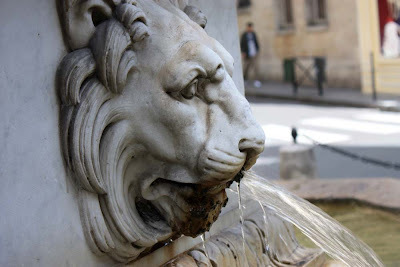 I am sure I will cross paths with some of you one-day, whilst others of course I will never meet in reality, yet I want to Thank You all for taking time to read my blog and to comment now and again. I do now, and have always, appreciated each and every comment. So, as a small thank you to you, my readers, and by way to celebrate my 555th post, I am going to have a giveaway. Here's are the things you will find in the A2K giveaway parcel. As you all have diverse interests and backgrounds I wasn't completely sure what to include in the A2K box. After deliberation I came up with these few items which I hope will have wide appeal. In the A2K giveaway you will find cookie cutters, a traditional Scottish cookery booklet, some coloured paper baking cups, a gardening mug, and finally - from one of the Scottish Museums - a 'Dig for Victory Now' pill box. So to be in with a chance to receive this parcel, please just leave a comment on this post. 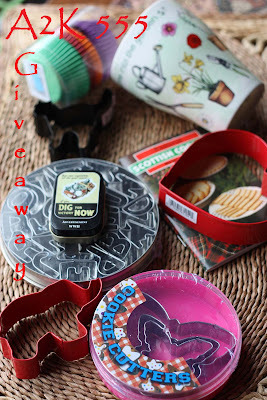 I will select the winner from the posts entirely at random, and the winner selected will be announced on Sunday 11th April, 2010. My overseas readers are most welcome to enter, as well as all of you silent background readers: here is a chance to participate and introduce yourself! Once again, may I take this opportunity to Thank You All for making this blog a personal success for me. I've had a long day today as I was in Berwick Upon Tweed for the early hours of the morning, and then the drive back to the West coast was miserable as there was rain, sleet and snow (sometimes all together). Hey I thought it was Spring. So I was glad when I finally got home to this flavourful golden soup flecked with green, red and brown. With the warm soup bowl cupped in my hands, I slowly slurped away savouring each mouthful - until of course I needed a spoon for the sweetcorn and beans. 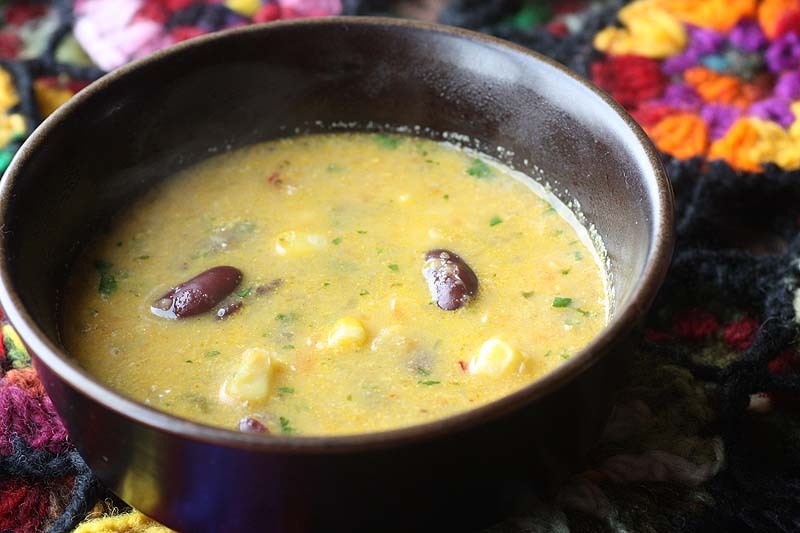 I made this spicy sweetcorn soup on Sunday along with the Shepherdess pie knowing I was going to have a busy week ahead of me. This soup is actually quite spicy, something that D commented on. 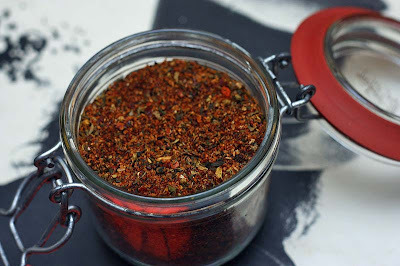 I personally appreciated this as my throat is still scratchy from all the coughing, so the additional red chilli hit was soothing somewhat, but feel free to omit this if you want it a touch mild. I haven't been able to grow my own sweetcorn here. 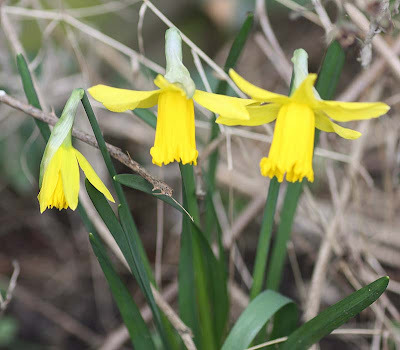 I know it can be done, as last year some fellow plotholders were harvesting their own (though not exceptional ones as they weren't exactly boasting about it). However, I haven't had any luck at all. 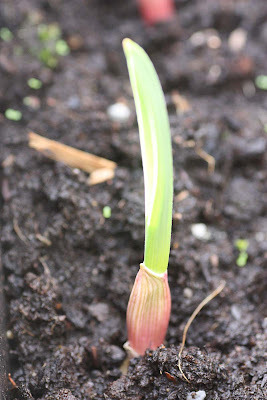 The closest I've come to growing sweetcorn here is with a variety called strawberry sweetcorn which I grew for popping. Although the little seeds imitated tiny red rubies, I have to tell you I was disappointed with the final result. Oh they grew well, they just didn't store well. 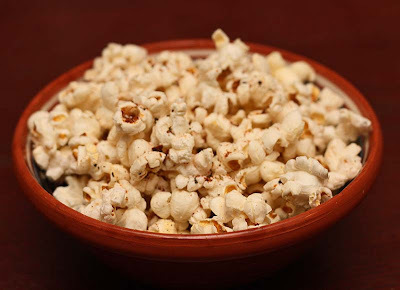 When I actually went to make some strawberry popcorn, each kernel had gone mouldy. 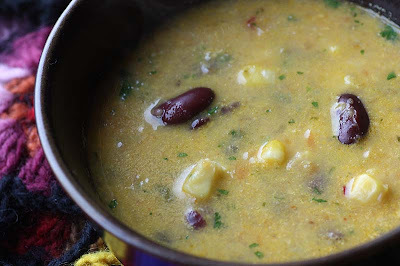 Anyway, I digress, for this spicy sweetcorn soup like many home cooks I am reliant on frozen sweetcorn and there is nothing wrong with it at all. Its a very good substitute for fresh, just like peas. 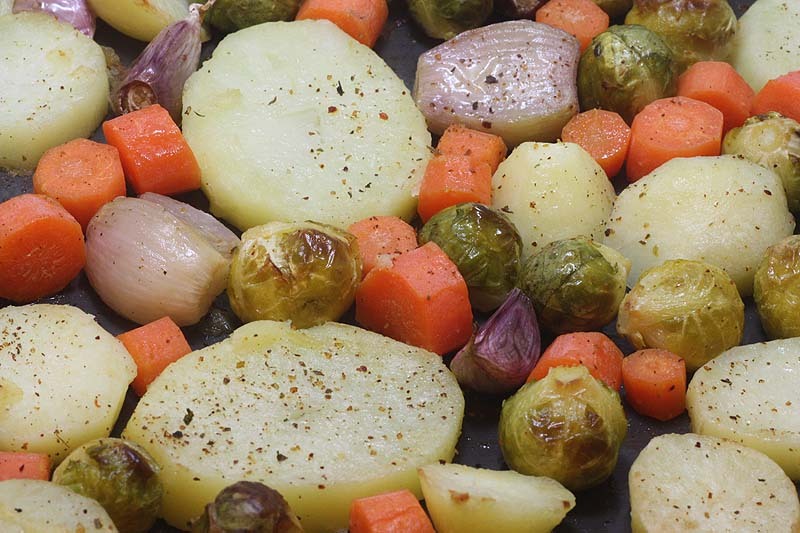 In a large pan, gently heat the oil, then stir in all of the vegetables. Cover with a lid, turn down the heat and sweat for 15 minutes, or until the vegetables are tender. Next add all the spices including the garlic and the red chilli if using. Cook for a few minutes, then add 200g of the sweetcorn and all of the water to the pan and bring to a boil. Then turn it down to a simmer and cook for 20 minutes. Remove the pan from the heat. When cool enough blend until smooth and season with salt and pepper. Now return to the heat and add in the remaining sweetcorn and kidney beans. Heat thoroughly, before stirring in the chopped coriander. Adapted from Cornucopia at Home: The Cookbook. 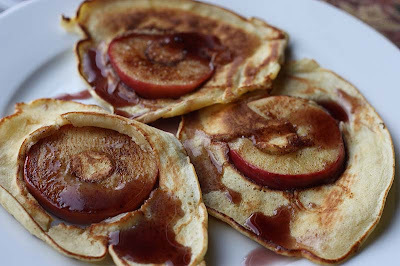 Pancakes are not just for Shrove Tuesday, but for breakfast - any time of the year too. However, these are not the flat thin pancakes that cover the whole of a frying pan, but small drop scone-like. What we know in the U.K as American style pancakes. 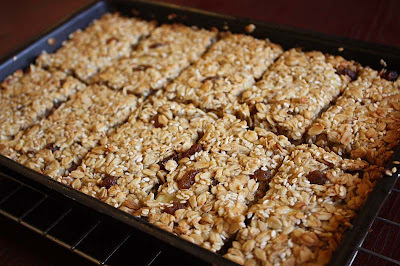 I decided to make some with apples, but I think they would work well with other fruit like bananas and pears. Although these were light and delightful to eat, I think they would have gone up a notch if they had been served with some sharp blackberries or even blueberries, but as they are not in season I substituted this gap with some blueberry syrup. A little expensive I admit, but it was a treat and one well worth it after being poorly all week. D appreciated them, all I could hear was 'nom nom nom'. 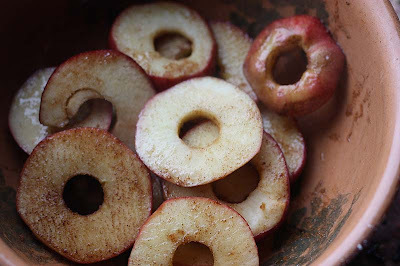 For the cinnamon apples: In a bowl, add the sliced apples, cinnamon, maple syrup and mix to coat. Melt the butter in a frying pan over medium heat. 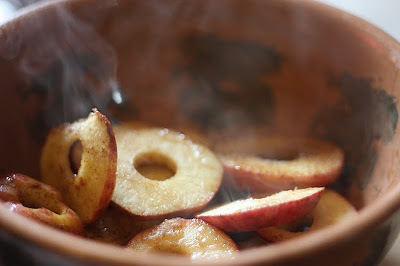 Add half the sliced apples and cook for about a minute until its starts to soften. Remove from the pan and cook the remaining apple slices. Set aside. Wash and dry the frying pan. For the pancakes: Sift the flour and the baking powder, then stir in the sugar. In another bowl, mix together the milk, puree, oil and 1 egg; gently fold mixture into dry ingredients until well combined. Add a little oil to a frying pan and gently heat; add four slices of apples in the pan a little apart, then drop in about 2 – 3 tablespoons of the batter over the apple slices. Cook pancakes about 3 minutes on each side. Continue doing this until all the apples are gone. Serve warm with honey or maple syrup. Idea inspired by Ainsley Harriot's Feel Good. If you have any left over, put them in the fridge as they do keep well and can be eaten cold. Although I am recovering from the sick bug, I'm still not 100% to my normal healthy sparky self. I have barely cooked since Friday, eating tinned tomato soup and shop bought pizzas. My sense of taste is numbed too and this has not been helped by the meals I've been putting together, all of which have been plain and pretty bland. This evening I fancied something a bit spicier and did D agreed, so I had decided on Thai green curry. You will find many variations of Thai red and green curry on my blog as it is one of my favourite and reliable recipes. The above picture was taken last year and it showcases produce all from my allotment plot: broccoli, carrots and climbing beans in yellow, purple and green. None of the vegetables I used in tonights meal were my mine, but they were all seasonal and grown in the U.K. The cauliflower and carrots were from Norfolk, England and the Shiitake mushrooms were from Ireland and the greens, well no green vegetables this time, but I did add some coriander which was grown in West Sussex, England. My taste buds were loving the flavours, but my nose ... not so much. to chase the cold away. D still in his sorry state, went out into the garden to put up some fat balls in the apple tree for the little birdies. He came back upstairs with a couple of bottle of elderflower champagne that I had made last year. I had actually forgot that I had stored them in the garden shed - fear of them exploding inside you see. He carefully opened a bottle over the sink, as the last time it went pop and fizzled all over. This time, yes it did go POP and it did fizzle over, but not so much. He quickly poured it into a large glass and then shoved it in my face ' do you want a sip?' 'Yes please!' I actually preferred the flavour of the elderflower champagne this time round, than I did six months ago, when I found it smelled not particularly pleasant. D sipped the rest slowly, and responded 'ahhhhh better than lucozade'. 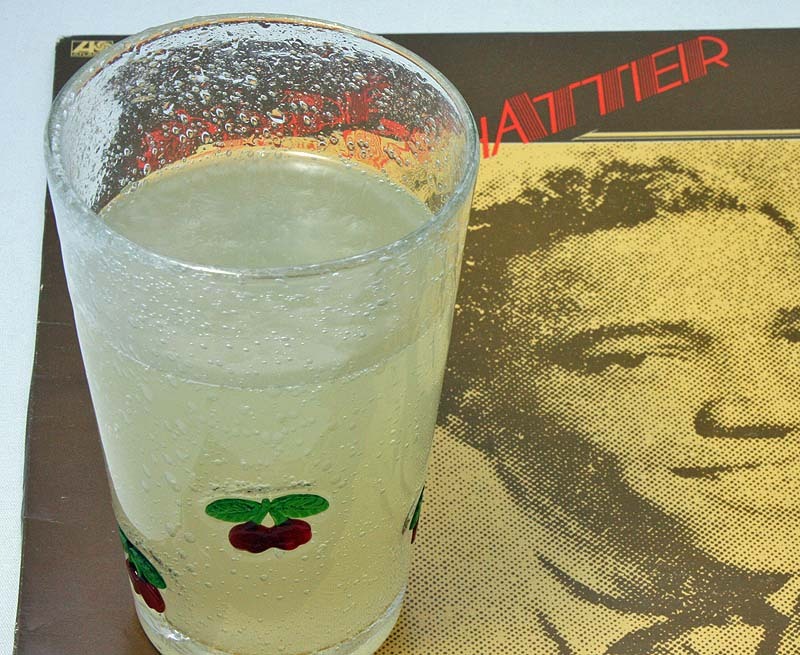 Sometimes, when your unwell a little carbonated fizz is good. Even though I had my doubts about the elderflower champagne recipe, I'll definitely be picking some elderflowers to make some more as it was a success. Until then, we still have eight bottles to enjoy - a treat for when were pottering in the garden. It should not be a surprise that the first seeds to germinate on my windowsill are the: 'Trocadero' lettuce. 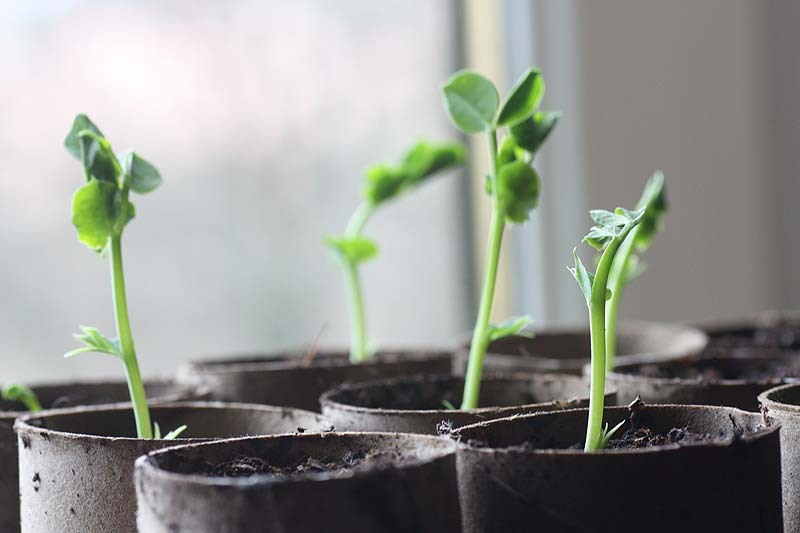 As you can see the seedlings are all pointing in one direction, towards the sunlight. 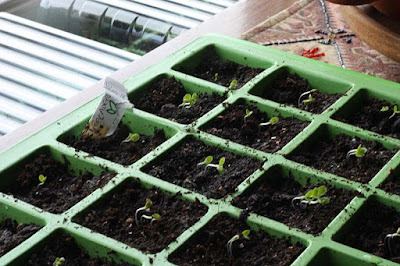 I have taken of the propagator lids as I am concerned the seedlings will shoot up too fast and be weak. 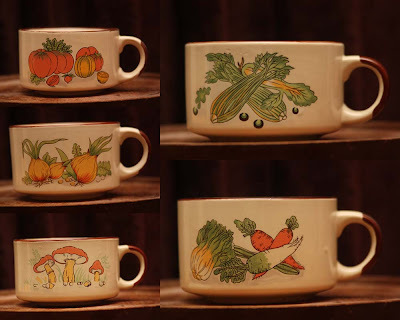 I am hoping to sow some other vegetable seeds this weekend. 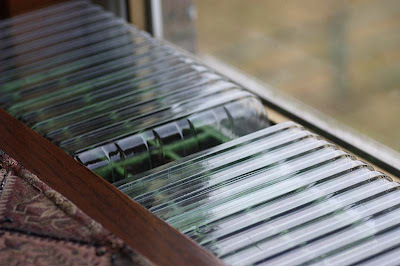 My problems soon is going to be space in every sense, where will I put these trays and trays of growing seedlings. I'll think about it this weekend. Yesterday I was in bed most of the day. Today it is my darling husband. I managed to crawl out of it onto the sofa to watch four movies. Yes four movies and blog-surf a little. Our diet in the last two days has been a lot of liquid: hot fluids, cheesy toasts and soup. Not home-made by the way, but the tinned variety. Oh what flavour was it? Tomato. Its the only shop bought soup we'll eat especially times like this. Thank you so much for your well wishes, I promise to respond to your comments when my head is not so fuzzy. Many of you will remember that I signed up to my first veg box late February, which was to be received on a fortnightly basis. Some of you will be surprised to learn that last week we took the decision to cancel our subscription. I know so soon, I barely gave the suppliers a chance. It was not a light decision, especially as we want to eat seasonal and locally sourced vegetables, but it was apparent pretty much immediately that the Veg box scheme was just not going to work for us. I also took into account all the comments fellow bloggers left for me when arriving at this decision. 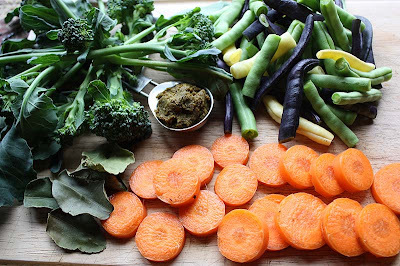 For us the Veg Box was not just just not going to be a good substitute for having been able to grow our own. I think having been a vegetable grower, albeit on a very small scale, my expectations, (some of which I admit would be unfair on the suppliers,) were not helping my reservations about the contents. It wasn’t so much the quality of the vegetables, but the lack of information about the variety of the vegetables. Any one who has grown vegetables would understand this concern. No malice is intended towards the suppliers, but within a few days the potatoes even though kept in a dark corner were sprouting, and the carrots were saggy; and these vegetables were meant to take me into two weeks. 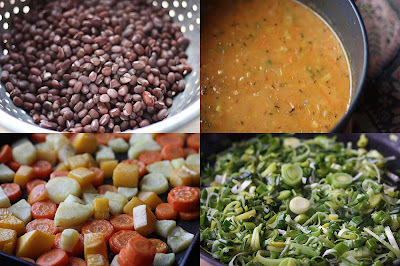 Despite, this I enjoyed creating meals with all these vegetables, but it wasn’t straightforward, as I also felt a bit under pressure as I did not want to waste these vegetables, but there was only so many potatoes one could eat! I could also foresee some vegetables languishing either in the fridge or in the vegetable stack getting mouldy by the time the next box arrived. I also foresaw many veggies going to the compost bin and that would be an expensive waste. The delivery date didn’t suit us either. If it was a Saturday, I may have been more inclined to stay with them and then I could try to plan our weekly meals accordingly, as this is how I worked with the vegetables I harvested at the allotment. 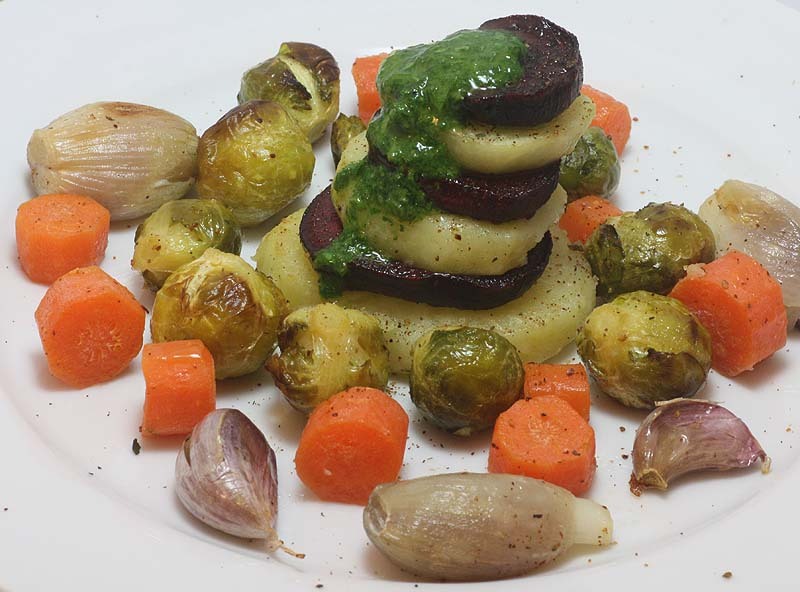 I also found that I was still supplementing, with onions, mushrooms and seasonal greens. The broccoli that came in the veg box actually caused me concern. Was it local? Something I still don’t know, but it was the first vegetable in the veg box to be used as I did not want it rotting in the fridge. 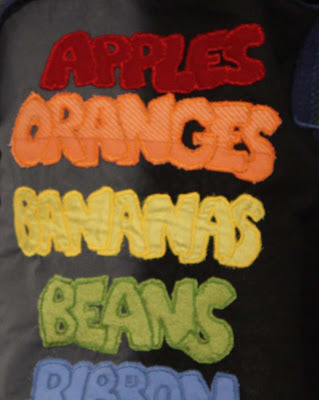 We also decided that paying £14 was far too much to pay for a bag that was essentially made up of potatoes, some root vegetable, a cabbage and a couple of leeks. D added he felt that we were ultimately paying for delivery of the veg box rather than contents (which we could both easily pick up ourselves). I truly do think Veg boxes are plausible initiatives and have always admired them as a lifestyle and luxury product, especially if you don't have time to go to the grocery store or live in an area where organic, local and seasonal options are limited, but that is not the case with us. Looking on the positive side, now that we no longer have the responsibility of travelling and tending to the allotment; and the garden being in our backyard and small, hence not needing hours of attention, at weekend we can venture out to little towns and villages. Some of which have farm shops and some have farmers markets, even our nearest city Glasgow hosts farmers markets, so we can easily pick up some fruit and vegetables there and plan our meals a little better. So its not all bad, we’ll just have to spend a bit more time pondering some of these places, and even though everything won’t be local, it’ll be seasonal and grown in the U.K (well most of it will be). 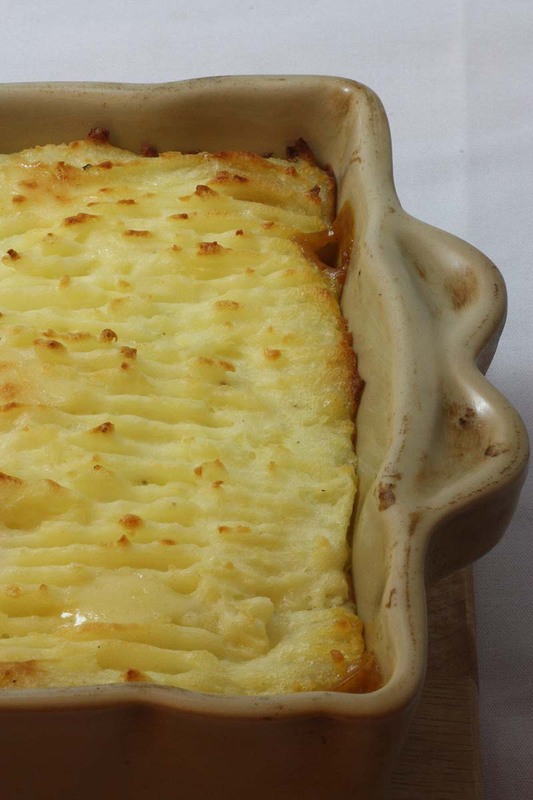 This is one of those good stand by store cupboard recipes. I used to make this often when quick cook polenta was easy to come by too, plus it was quite simple to put together after a hard days work. Then I got the allotment and my focus shifted to seasonal and fresh produce. I only rediscovered the recipe, whilst I was dusting the bookshelf and started flicking through some of my celebrity chef related books and looking at some of recipes I had vegified over the years. 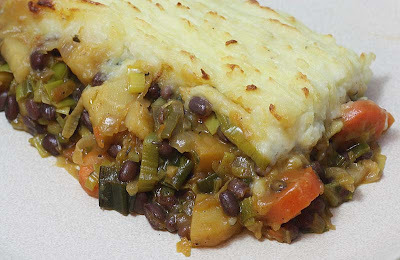 But this particular recipe for Mexican Tamale Bean Pie was already vegetarian. 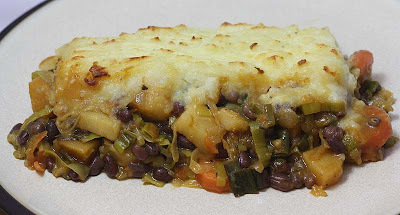 Do you fancy a Tamale bean pie tomorrow? Do you even need to ask! was the response. 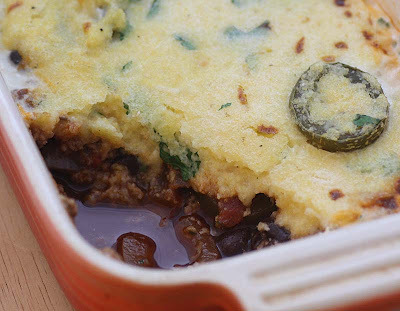 This recipe can only be described as a 'vegetarian Mexican shepherds pie', but spicy. I would even go as far as to say, its good, honest home grub. 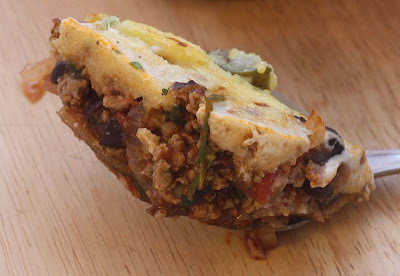 D says he could eat this Tamale bean pie every-day. It delicious, that's for sure, but I seriously don't think he could eat it every day. For a start I won't be cooking it every day and secondly, he needs his vegetables. Spinach to have muscles like Pop-eye; carrots for good vision like Superman; and sprouts...err, well you need some vegetables to make you strong. 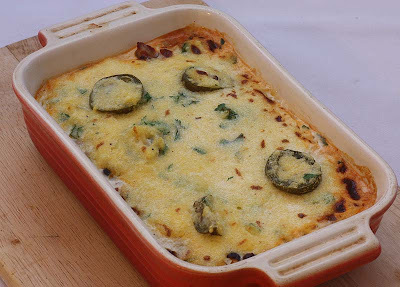 Beat together the polenta, egg, milk, cheese and 2 tablespoons of the coriander. Season and leave to stand for 20 minutes to allow the polenta to swell. Meanwhile, heat the oil in a large pan and fry the onion and garlic until softened slightly. Add 50g of the jalapenos, the Quorn mince, tomatoes, tomato puree, beans, stock, lemon juice and remaining coriander and cook on gentle heat for 30 minutes. Season to taste and pour into an ovenproof dish. Preheat the grill to high. Stir in the remaining chillies into the polenta mixture and spoon over the mince mixture to cover. Grill for 5 minutes or until golden. Adapted from Ainsley Harriot's Low Fat Meals in Minutes. Two years ago I was in Belfast for a training session. I got the opportunity to wander the city centre and see some of the sights. And like any tourist, I picked up a few souvenirs which included a couple of tea-towels and this. I just couldn't resist. 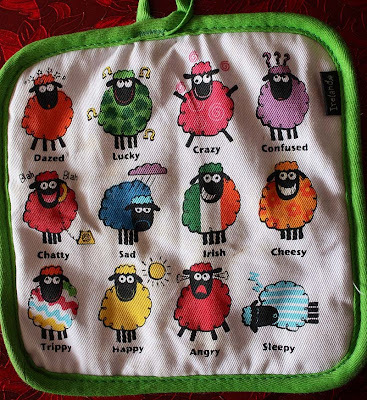 Which sheep do you like? I like them all, but I have a soft spot for Crazy - just look at those eyes. There are going to be a few sore heads tomorrow. Happy St Patrick's Day to those of you who celebrate it. 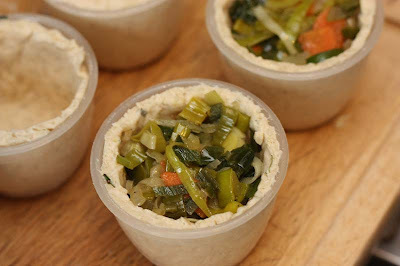 I made these a few days ago with the leeks from the veg box. Oooh veg box, I forgot to tell you all I took the decision to cancel the veg box, but I'll tell you more about that later. 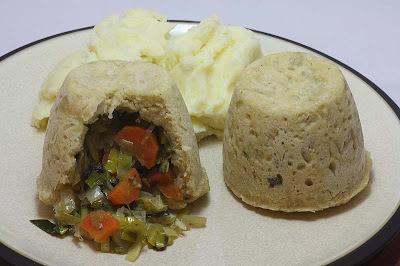 Lets just focus on these Savoury suet puddings for now. With it still being a bit nippy, this kind of food is still welcome on the menu. 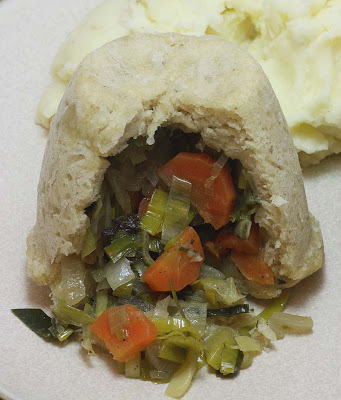 Luscious flavourful leeks and half moon carrots in a light soft pastry. And of course, it had to be served with some mashed potatoes and gravy. D pointed out that I could have added some cream or cheese to the filling, and the original recipe did suggest that, but I wanted to keep it vegan. I am so glad I did. I’ve made a variation of the savoury puddings before with mushrooms and shallots with ‘truffle’ sauce, but that was one large one when I had friends over, there was a sense of occasion cutting through the suet pasty and serve. This time I decided to make individual portions. So dainty on the plate they were too. I used these plastic pudding containers that came with a lid, but if your making this recipe, and don't have pudding lids, you just need to cover the pudding well with foil. I still had to do this as two of my pudding lids were missing. Heat the olive oil, add the onion and leeks and sweat on a low heat for about 20 minutes, until soft. Then add the carrots and vegetable bouillon powder and thyme and cook for a further 10 minutes, when they have softened. Season well and turn of the heat. Mix all the dry ingredients and the herbs in a large bowl. Mix in enough cold water to make a firm dough. Divide the dough into 5 - 6, roll the pastry out on a well-floured work surface, to about 3mm thick circles that are big enough to fill the pudding basin with a small overhand. Line the pudding bowls with the pastry, gently easing it round the sides for a snug fit. Divide the filling between the pudding basins. The filling should be 1cm below the rim. Take each pudding in turn and with a sharp knife trim off the excess pastry level with the rim. Re-roll this excess pastry and cut out 6 circles big enough to cover the tops. 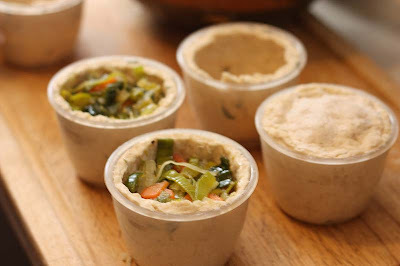 Place the pastry tops on top of the filling and press the edges together to make a firm seal. Trim off any excess. Place the puddings into a steamer. Cover with the lid and steam for for 30 - 40 minutes, or until the pastry is cooked. Leave to cool for a few minutes and then ease a small knife around each pudding and turn them out. Slightly adapted from Rachel Demuths Green Seasons Cookbook. I don't have any roots in Ireland, but I do very much enjoy the sense of occasion that comes with St Patrick's day. This year fellow bloggers across blogosphere will be joining in the celebrations too and creating culinary delights, as well as those you can drink and get rather tipsy on. 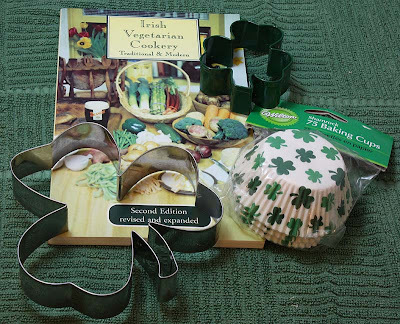 I thought to myself why not join in and do a little bit of Irish cooking too, but other than the numerous delicious potato recipes which incidentally are accompaniments, you have to admit that 'traditional Irish vegetarian food' is pretty much an oxymoron. (I am happy to be told that I am wrong). So I decided to do a bit of home-baking instead. 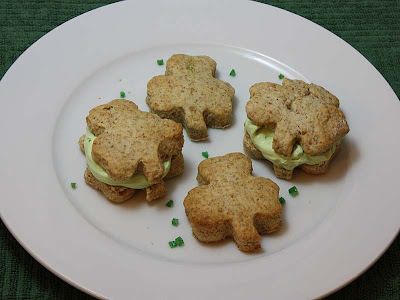 May I present to you my Shamrock Brown Scones. For those of you who may not know, may I share with you that St Patrick used the shamrock as a symbol to explain the concept of the holy Trinity in Christianity. 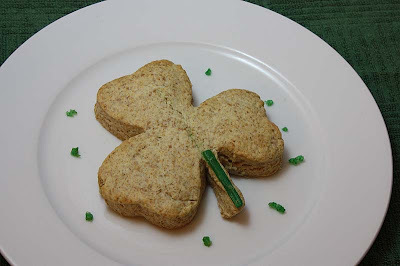 Believe it or not, these Irish Brown scones actually come from an Irish Vegetarian cookbook. As someone who enjoys eating her spuds and vegetables, last year like a mad woman I hunted for a Irish Vegetarian cookbook and could not find one, by heck I could. Eventually I tracked on down in Edinburgh at an independent bookshop called Word Power. Whilst in Edinburgh, I also picked up some pretty shamrock baking cups, unfortunately it looks like I won't be using them this year. 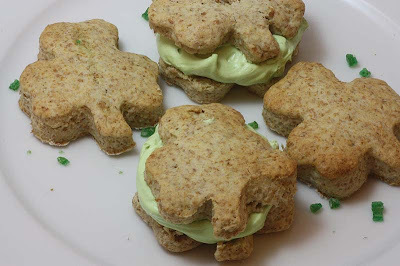 I am submitting these scones to The Daily Spud who is hosting a Paddy's Day Food Parade on the 17th March. A great way to join in the revelries without leaving home, especially as I'm doing the early shift the following day. Instead of plain whipped cream, I thought I would apply a little natural green colouring to the whipped cream, and sprinkled it with a some little green gems (chopped Angelica). To make it more patriotic, you see. D said all that was missing was a green jam or preserve, something like gooseberries. mmmm Maybe next time. 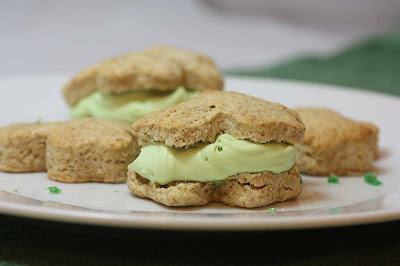 Most people know how to make a good scone recipe, so I won't publish the recipe here. But for your information this one uses half plain flour and half wholemeal flour, full fat butter and full fat milk. Well its got to have full flavour. Recipe made from Irish Vegetarian Cookery: Traditional and Modern by Patrick Cotter (and no he is not related to Denis Cotter of Cafe Paradiso). 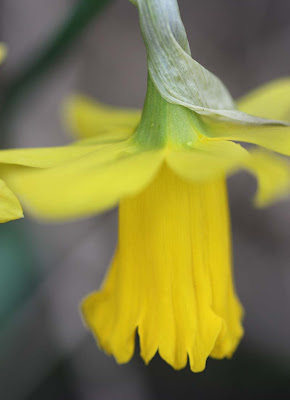 This weekend the enormity of what we've lost at the allotment hit me more, especially as its the start of the sowing season. I am trying to be upbeat, buts its not easy. We've had to replace so much equipment that cost us so much in the first place. 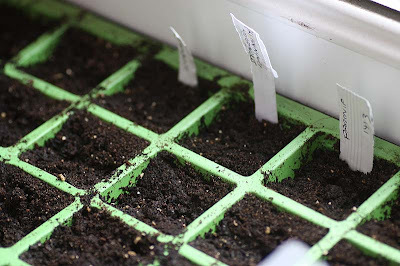 Even the lack of small things like seedling trays and planter labels bring my mood down. I get hit now and again by a mix of emotions: anger, frustration, sadness and feel bouts of gloom. Then I can't help myself and mumble something to D about the allotment plot and the losses. I know he's feeling what I'm feeling too, but is not showing it like me. Also he doesn't want me to get too down in the dumps, so doesn't encourage this kind of talk or fester in this mood of mine. On days like these, he's being optimistic for the both of us. Anyway on a brighter note, we had to go to the garden centre to buy things including those mentioned above. When we got there I saw these self-assemble '3 foot by 3 foot' raised bed. 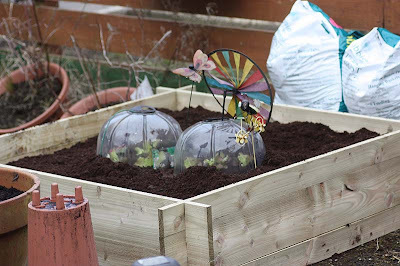 I quickly thought in place of some of the pots and containers I could have one of them, especially as it would free space in the original bed for larger plants. In it I could plant, salad leaves, lettuces and radishes. 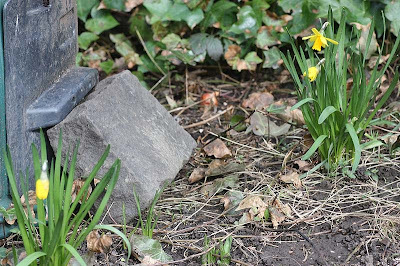 I don't know if D genuinely agreed with me, or thought 'Thank goodness she's suddenly sparked up', but we ended up coming home with one with a number of compost bags. After a cuppa tea, we ventured into the garden only to be hit by the spitty rain. But it was light rain, not heavy to stop us from assembling this bed. Once assembled, only a matter of minutes. D tipped in some old soil and fresh compost. You can see how eager I was, I have even put some shop bought lettuces. 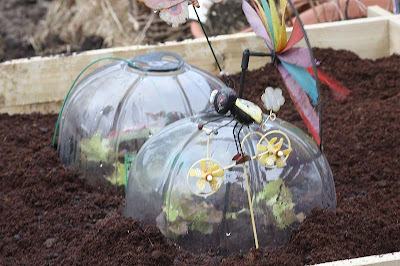 As its still quite chilly, I covered them over with these plastic propagator bells, but I needed something to hold them down and stop them from blowing away. All I could find were these garden stick toys. There having some real function right now. I also planted in these two very large pots Arran Pilot potatoes, an early variety. 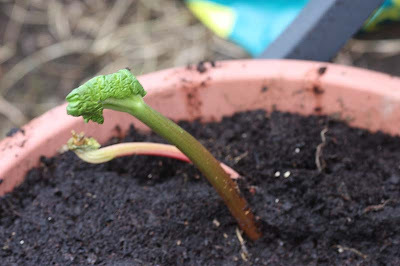 Whilst at the garden centre I also picked up Timperly Rhubarb plant, as the Victoria one I had grown from seed last year had rotted away. I'm not expecting much of a harvest from it this year, I'm just happy I have some growing now. 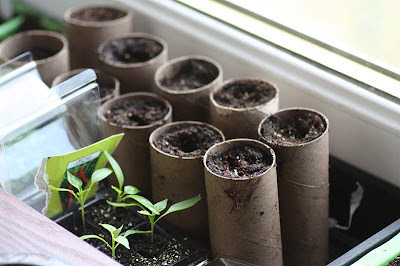 When I got back up to the flat, I planted Cavalier peas and Purple Queen, a dwarf french bean in these recycled toilet rolls. Its the first time I am growing this variety. Next to it you can see some chilli seedlings. I picked up these from a local supermarket on Friday, they were going for £1 for 4. Chilli plants are one plant I can't seem to germinate well myself, so thought why not. Once they get to a good size, they will be living on the window sill anyway. Make shift paper labels for the White Gem parsnip and Snowball turnip. In the past we were fortunate to do all this in a greenhouse. Now space is really at a premium, especially in our flat, so everything that was on window sill has moved to make room for these trays. Under these propagator boxes are: Trocadero lettuce, strawberry spinach, Sunshine Giant sunflowers. 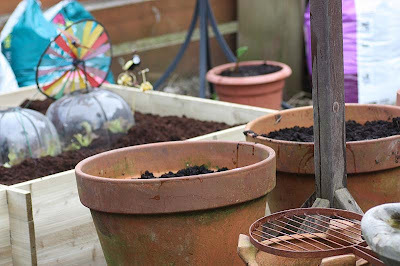 I also planted Cabbage Hispi, Broccoli Arcadia and the wonderful Nero di Toscana kale. 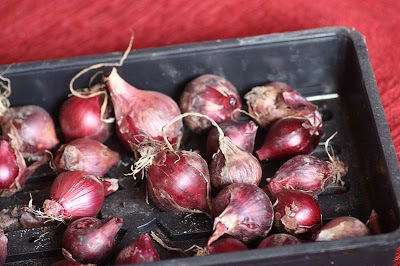 Oh while D was going through the shed he came across some red onions that I had harvested from last year, and remembered being disappointed at them because they were all so small. I gave them all a gentle press. The majority of them were good, a nice bonus - I think caramelized onion tarts may be on the menu soon. I actually enjoy eating gnocchi and it was the fresh home-made one that got me liking them. My first ever attempt was with Nadine Abensurs dolcelatte gnocchi and I was completely sold. The last time I made gnocchi from scratch was last year with freshly picked stinging nettles from the allotment plot. Nettle gnocchi may not sound appealing, especially as its a wild weed, but if you trust my taste buds at all, please let me tell you nettles are really tasty. The only flavour I can compare nettles too are turnip greens. If you’re a stinging nettle virgin I recommend perhaps trying it first in a simple soup, then you can expand your repertoire: nettle risotto maybe, another delicious concoction. 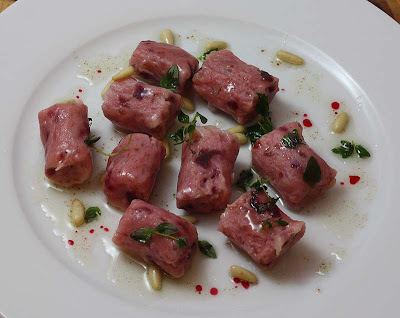 Here I have made some beetroot gnocchi, the recipe did specify to puree the beetroot, but I just decided to blitz it in the food processor, because I like a bit of texture. It worked out very well. 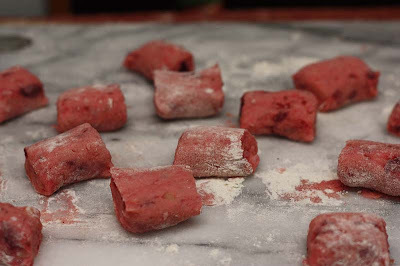 Visually I’d describe the gnocchi as mottled beetroot clouds, but they were not exactly light like clouds but nor were they stodgy. Believe it or not it was really good gnocchi with the subtle earthiness of beetroot coming through. D really enjoyed it but thought perhaps a goats cheese would have complimented the flavour of the beetroot a little more. And me, well I have to admit although I’ve really enjoyed experimenting with beetroot, I can’t say the same for eating it. I won’t say I like eating beetroot, but I actually don’t mind it and that’s a good relation to have with a vegetable, don't you think?! 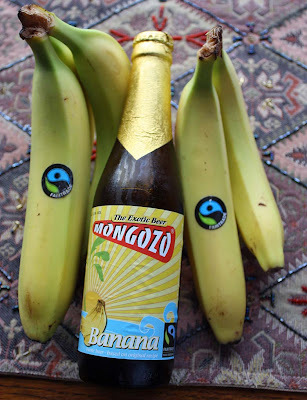 Put all the ingredients into a bottle or jar and swirl for the flavours to infuse. Leave aside while you get on with the gnocchi. Toast the pine nuts in the oven until golden, set aside. 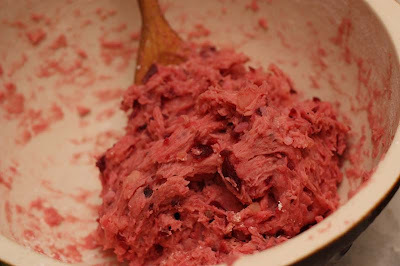 Gently stir the beetroot into the mashed potatoes until well combined. Make a well in the centre of the potato mixture. Crack in the egg and season, to taste, with salt and freshly ground black pepper. Add the flour and mix to form a dough. Knead lightly for a few minutes on a lightly floured surface. Divide the mixture into four or five pieces and roll into 2cm diameter ropes. Cut each rope into 1 inch pieces. 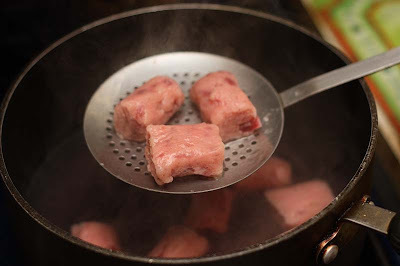 In batches, drop some gnocchi into a large pan of boiling water. When the gnocchi rises to the surface, scoop them out with a slotted spoon. Season to taste with salt and freshly ground black pepper. To serve, divide the warm gnocchi among eight serving dishes. Scatter over the pine nuts and drizzle over some flavoured oil, warmed a little if you wish. 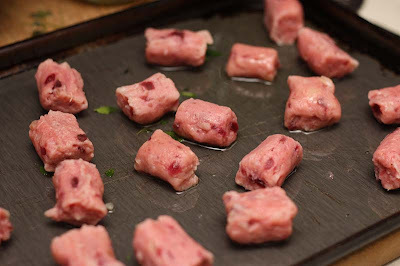 Note: Whilst I was making the gnocchi, I found the texture of the mashed potatoes, beetroot and flour pliable that I did not think it required an egg, so use your judgement if you wish to make a vegan version. Adapted from here.